March 25, 2019 | Austin Raper, Ph.D.
March is Multiple Sclerosis (MS) Awareness Month and we’re giving MS patients and advocates at CoverMyMeds an opportunity to voice their experiences and shared mission of getting patients the medications they need to live healthy lives. Despite nearly one million Americans suffering from MS1 and limited treatment options available, some people have never heard of MS or aren’t quite sure of what it is. Current medications for MS are all considered specialty and pose significant access barriers to suffering patients.2 A solution to the complicated specialty process that connects all health care stakeholders is needed to support and streamline the patient journey for MS patients. To really understand the disease and the challenges that patients face on a daily basis, we interviewed several folks at CoverMyMeds that have first-hand experience with the illness, both as patients and caregivers. 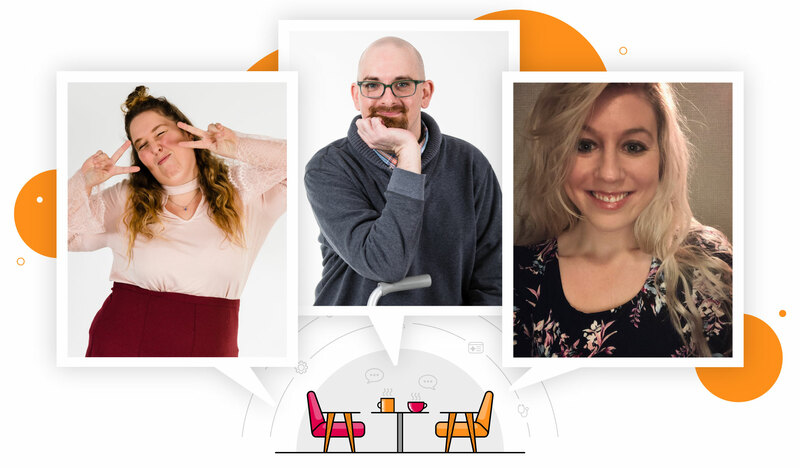 Michael Miles, Brigette Bartlett and Autumn Blatt of our dedicated support team took time out of their busy days to talk about how MS has personally impacted their lives. CoverMyMeds: We really appreciate each of you taking time to tell your stories. Let’s start with your experiences with MS and then circle back to your advocacy efforts. Can you each describe how MS has affected your life? When did you first hear about it? Michael Miles (MM): Multiple sclerosis has affected my life in every way imaginable. I was diagnosed 16 years ago at age 20. I had never heard of the disease at the time. I’ve lived my entire adult life in pain, and I assume the rest of my life will be no different. My symptoms can flare-up without warning. They started as numbness in random parts of my body but have progressed to paralysis and frequent exhaustion. I went through a lot of testing before being diagnosed with MS as doctors tried to rule out all other possibilities. Afterwards, many people in my life abandoned me, including my fiancé at the time and close family members. It’s hard for some people to accept or believe that a young person needs to park in a handicap spot or use a cane to walk. Their reactions can be cruel. I have been assaulted because of this several times in my life as well. Brigette Bartlett (BB): I was diagnosed with MS in 2015. Similar to Michael, I experienced numbness and tingling in different parts of my body until eventually I could not feel my left leg or arm. I remember going to a restaurant and having to lean on walls to walk. People thought that I was drunk! When I went to the doctor, they said it was either a brain tumor, an infectious disease or MS. I had no idea what MS even was! I can relate to Michael in that, after my diagnosis, a relationship and several friendships ended. Often times, I was too exhausted to go out with friends after work and on the weekends – this put strain on friendships. Autumn Blatt (AB): My biological mother and aunt both have MS. I was young when they were diagnosed and had never heard of the disease. They both had periods of exhaustion and were in a lot of pain. I remember that diagnosis took a long time for my bio-mom and it was difficult to afford therapy. CoverMyMeds: Thank you for sharing those difficult stories. From your answers, there seems to be a need for additional MS awareness and patient advocacy. None of you had even heard of the illness before it personally affected you. What has been your experience with treatments for MS? Is it tough to get on therapy? MM: Treatments for MS vary depending on type and progression of the illness. Patients with primary progressive MS (PPMS) have one FDA-approved therapy.5 Those with early-stage relapsing-remitting MS (RRMS) have quite a few FDA-approved therapy options, while those with later-stage secondary progressive MS (SPMS) have close to no specific therapy options, but several are in development!6 In my experience, most of the available medications range in price from $3,000 – $9,000 per month. I’ve been emotionally and physically crippled by this disease for 16 years but have not been able to afford MS therapies, even with insurance. One doctor even confused my inability to pay with a refusal to take the prescribed medication! The process for getting on therapies is also difficult and confusing. For these reasons, I’ve only managed my symptoms and pain. I can’t help but wonder if some of the damage to my body could have been avoided if I had access to these meds. BB: I completely agree with Michael that starting MS therapies can be difficult. After my diagnosis, I was prescribed an MS medication and it took four months to start therapy. In addition to lab work, my insurance required prior authorization (PA). I was initially denied therapy and asked to try a painful injectable, but my doctor appealed, and I eventually got an oral drug. Since then, I have changed insurances a few times and each time the process starts all over again. Before taking the medication for the first time, or after accidentally missing a dose, I had to be monitored in case of an adverse event, which was tough to coordinate with my schedule. Also, my medication was only available through the mail and had to be signed for or else I’d have to drive all the way to the mail carrier’s pick-up location. For someone with MS, in which physical exhaustion is a common symptom, it isn’t easy to start therapy. The process was frustrating because I had no control or visibility into what was going on and could not get straight answers on the status of my prescription. Fortunately, I have not had an MS flare-up for several years and have been able to suspend therapy. I want to see how my body will react without medication, or figure out if I even need medication, and to think about starting a family. AB: I definitely agree with Michael and Brigette. Financial barriers, a complicated PA process, as well as a lot of charts and lab work are a few of the challenges that MS patients face when starting a specialty therapy. For many patients with RRMS, including my family members, flare-ups can put them out of work for different periods of time. They need access to medications during these time intervals or their medical and financial conditions can quickly spiral. CoverMyMeds: Getting on specialty therapy is not easy and MS patients may need additional support during the process. What else do you want people to know about MS and MS patients? How can people get involved to help? MM: There is a saying among MS patients, “Once you’ve met one MS patient, you’ve met one MS patient.” In other words, the MS experience is different for each patient. The very nature of the disease makes it unpredictable and unique to each person. You might meet an MS patient who never needed to use a cane but talk with another who has to use a wheelchair. People can get involved by donating to or volunteering with the National MS Society (NMSS). There are also upcoming fundraising walks, with CoverMyMeds teams in both Cleveland and Columbus. That said, it doesn’t really take a lot of time, money or energy to help someone with MS. Helping could be as simple as holding the door open for them or just being a compassionate person who listens. BB: Similar to Michael, I want people to know that no two MS patients are the same; however, we are all hoping and fighting for the same cure. To find a cure, we need to continue spreading awareness and funding research into MS. As Michael mentioned, events like Walk MS® are perfect opportunities to show support and make donations. This year, we are excited to have sponsorship from CoverMyMeds for our teams. AB: I think we all can help by educating ourselves as individuals and as a community about how MS works. Be gentle, patient and open to giving assistance when needed. If you are interested in getting involved with Walk MS this year, the Cleveland walk is in April and the Columbus walk is in May. CoverMyMeds: Thank you all again for sharing your insights and experiences with MS. Your fierce advocacy is sure to make a difference in the lives of MS patients and caregivers. Your insight highlights how expensive and inefficient the patient journey currently is for MS therapies. Communication among health care stakeholders and technological support during diagnosis, access and adherence is needed to improve the specialty process. To learn how CoverMyMeds is evolving technology to help patients get the medication they need to be well, visit go.covermymeds.com/specialty.